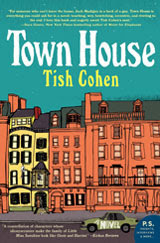 Three cheers for Tish Cohen’s Town House, which proves that popular fiction does not have to be stupid. The eponymous town house is in Boston, home to Jack Madigan, the agoraphobic son of a dead rockstar. Life presents particular challenges for him, unable to step beyond the front door. These challenges are only underlined when they involve Jack’s teenage son, his somewhat batty real estate agent, and the precocious little girl who crawls in from next door through a hole in the wall. Cohen has created a cast along the lines of a John Irving novel, or The Royal Tenenbaums, and she uses sympathy to negotiate a balance between quirky and real. It was apparent to me that Cohen must have so loved these characters, to invest them with multi-dimensions and have them keep surprising us. When their lives turn out a little too tidily, we’re glad they do, because we have come to love them too.